A: The idea that we have to consume a lot of cow’s milk for strong bones is deeply ingrained in our society, but it’s based mostly on a successful PR strategy by the dairy industry rather than scientific fact. Believe it or not, anthropologists know that people in hunter-gatherer societies who didn’t consume milk had much stronger, healthier bones than people from agrarian societies who did. It’s true that milk is high in calcium, and 99 percent of the calcium found in the average adult body resides in our bones. But the long-held belief that we need plenty of calcium to prevent osteoporosis—a disease characterized by porous and fragile bones—isn’t as accurate as you’d think. Numerous studies have found no association between high calcium intake and lower fracture risk. 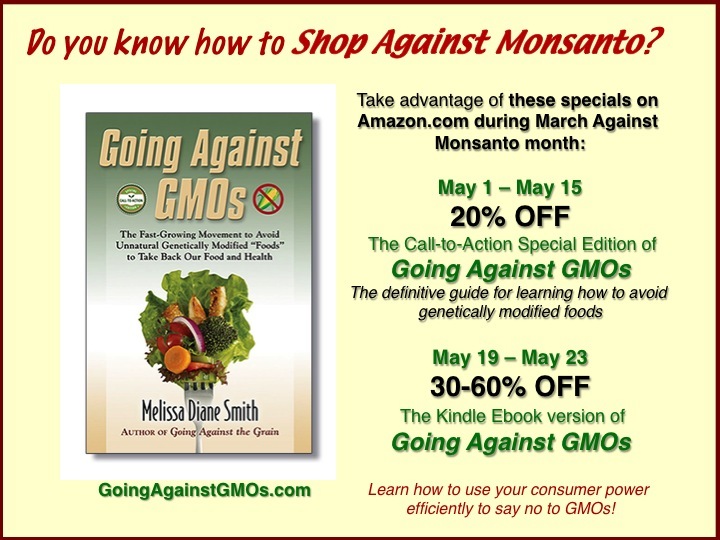 Take Advantage of Big Discounts on ‘Going Against GMOs’ in May! On May 21, 2016, hundreds of thousands of concerned individuals will gather across 38 countries and 428 cities to join in an international peaceful protest against the Monsanto company as a part of the March Against Monsanto grassroots campaign. The event is a terrific vehicle for physically and vocally expressing public disgust and anger over the corporate takeover of our food by Monsanto and other chemical corporations and for raising awareness of the dangers surrounding Monsanto’s genetically modified seeds and cancer-linked herbicide Roundup.